Prolapsed discs commonly known as herniated or slipped discs are associated with back pain and neck pain. The lumbar spine is the most common part of the spine to prolapse a disc followed by the neck and then the middle back. 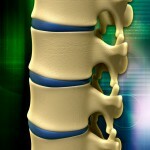 The spinal column is made up of vertebral bodies separated by discs. The discs help protect and aid flexibility and good movement of the spine. The discs are ‘donut’ like. The outer part of the disc is called the annulus fibrosus and the inner more jelly like portion of the disc is called the nucleus pulposus. It is only in the outer one third of the annular fibrosus that pain receptors are found. When the disc fluid starts to leak it will only be felt when it reaches this layer. As we age we develop wear and tear in our disc. Some disc are more prone to degeneration such as the lower lumbar levels. The outer fiborous layers can begin to crack and the inner jelly like fluid can leak into these spaces causing pain. Under extreme anterior disc pressure as in daily prolonged sitting postures and poor lifting techniques the pressure is applied to the front fibrous layers pushing the inner fluid backwards. If the fluid leaks backwards and protrudes out of the disc it can push on the peripheral nerves existing the spinal cord causing extreme pain which can radiate along that path of the associated nerve. Most people associate prolapse disc pain with severe low back pain with/without leg pain. Yes, this of course may be the case but sometimes you may feel no pain in your back at all but may feel pain elsewhere along the leg. Prolapsed disc can be easily treated if treated in time. Your physiotherapist will educate you on your back and explain to you what is going on and why you are getting your pain. However, if you ignore the tell tale signs that your back is telling you then you may be leaving yourself open for a serious back problem developing and the possible need for back surgery. If you experience lack of control of your bladder/bowel, feel numbness around your bum area and/or have weakness in your ankle you must go straight to A+E as it maybe that your disc prolapse has touched the spinal cord. Unfortunately surgery is the only option here. So to avoid this serious circumstance occurring visit one of our physiotherapists to have your back assessed and treated. The first thing necessary is to educate the patient on their back. Look at the spinal alignment and posture to see what stresses are adding to the disc. Identify their daily activities to see if they are in a job whereby they sit for most of day e.g desk worker, taxi driver or have to perform lifting task e.g. nurse. Discs will tend to prolapse backwards so by performing physiotherapy techniques to improve extension of the spine the disc fluid can return to the center thus taking any pressure off the outer third of the disc where pain can be felt or reduce the impact of the fluid on the nerve roots. Our McKenzie trained physiotherapists specialise in the treatment of back pain. The techniques devised by Mr Robin McKenzie, a New Zealand base physiotherapist who devoted his life to the treatment of back and neck pain formulated a set of exercises which can be used to both treat and asses back pain cases. His books treat your own back and treat your own neck have made it to the best sellers list in New Zealand.